It’s nice to be back up at Stocks for the weekend. On Saturday Stocks played host to the Scierra Pairs Competition, given the hot and bright conditions there was some very commendable catches and those anglers who thought ‘outside the box’ came out on top. Order of the day was fast sinking Di5 and Di7 lines with Coral and Olive Snake Flies being most effective using a medium to fast retrieve. 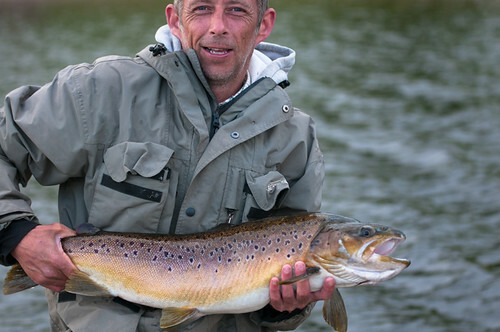 Most fish seem to be favouring the deeper cooler water at present and areas such as the East Bank, Hodder Trench and the Dam are producing the best catches. The winning team yesterday where Jim Hunter and Eddie Clark who took 10 fish to their boat mainly on Snake Flies, they stayed in the same piece of water all day drifting from Gull Island to Grange Point, they found a Roly-Poly retrieve did the trick, Good angling lads! Coming in a close second was Alister Beaumont and Stuart Hall with 8 fish to their boat, they found their fish down the East bank from Blackhouse Bay to Halsteads Hyke as did Derek Moore and Felicity appleton who had 7 Fish to their boat. One notable catch from the bank was Keith Landless fishing Nymphs on a floating line, Keith had 3 fish at the Dam on Friday including a lovely Brown Trout of 2 ½ lbs. The weather for the next week is set fair but there seems to be a bit more cloud cover around so hopefully this will bring the fish up in the water and allow anglers to target rising fish on floating lines, when this is the case I find nymphs and diawl bachs fished in a washing line with a Booby on the point or a team of Hoppers fished in the surface film produce the best results. On a final note I would like to say congratulations to Ben and Charlotte Dobson who are celebrating their 20th Wedding Anniversary this week. This entry was posted in Stocks Reservoir Fishing Reports on July 1, 2018 by staff.